Carrying Bag – Duffle style bag to carry the entire TravelScoot and all its components. Red Canvas Trapeze Pouch (Caddy) – Fits on the frame of the TravelScoot with attached Velcro straps. The Caddy is ideal for carrying purses, cameras, jackets etc. Tool Kit – Consists of 6 Alan keys and tucks inside a small hidden pocket located on the front of the fabric Caddy. Seat Spacers – raises the height of the seat for taller scooter operators. Steering Stem Bungee Cord – Secures a walking cane or set of crutches to the TravelScoot. TRAVELSCOOT MOBILITY SCOOTERS ARE COVERED BY MOST MAJOR CANADIAN INSURANCE PROVIDERS. *180 lbs. /82kg rider on level terrain with few stops can expect approximately 12 miles (19 km) with the 160 Watt/hour high output Li-ion battery. Lighter riders can expect longer distances, heavier riders can expect shorter distances. The TravelScoot is by far the world’s lightest, strongest and most compact electric mobility scooter. 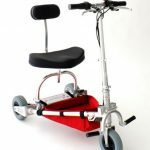 It is the ideal scooter for those who have some mobility but have difficulties with longer distances. The TravelScoot Deluxe 160 weighs 33 lbs (14.9 kg) with our air-travel-approved 160 Watt-hour lithium-ion battery. It’s the perfect companion for anything from a quick trip to the grocery store to extensive international travel. The all new high output Lithium Ion battery has increased the driving distance without increasing the cost. Simple and extremely robust, the scooter frame is made from high-strength 7005 Aluminum (Aircraft Grade). 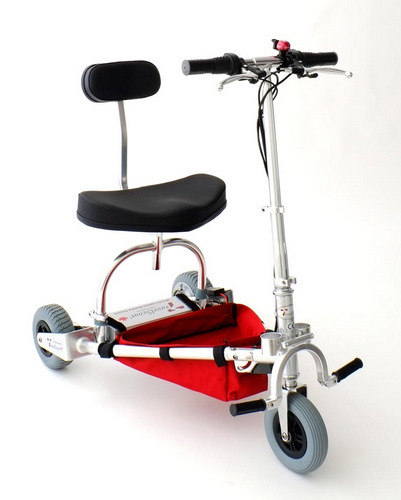 The patented, innovative folding mechanism allows a 3-wheeled scooter to fold down to the dimensions of a 2-wheeler. The TravelScoot Deluxe 160 is also available in a Junior version for those under 5′ in height.